Rangla Punjab refers to the lively and colourful rural roots of the state, and the name has been made famous by a decade-old song from Sarbjit Cheema. 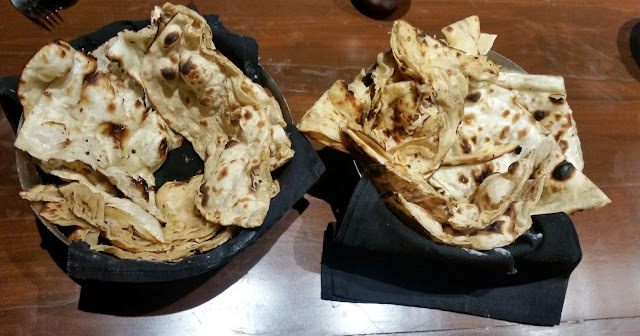 Using this concept, Punjab Grill is showcasing recipes from rural Punjab and across the border through a promotion called Rangla Punjab at their restaurant in Jubilee Hills Hyderabad. The corporate chefs of Punjab Grill have done a great deal of research into the cuisines of interiors of the state to discover hidden recipes. Most of the restaurants where we go for Punjabi food, usually serve a fixed set of dishes with very ordinary taste. 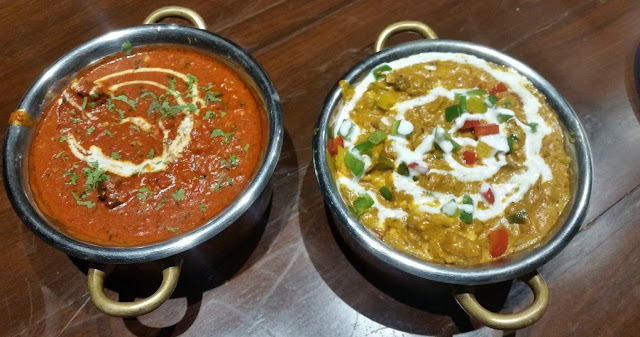 In Hyderabad, you have the Delhi version or the localized spicy Hyderabadi Punjabi food which is usually served in most outlets. Not many places choose to present Punjabi food in its authentic avatar. Against this backdrop, this festival has generated a lot of expectations. Invited to a preview of the festival, we were first served Kali Gajar Ki Kanji in an earthen pot. This drink made of dark carrots and mustard brought back fond memories of my childhood, when a five-year-old kid with his brother used to periodically dive into the flat of Mamaks, their Punjabi neighbours in Lansdowne Road, Calcutta to ask for a glass of this drink, which was a permanent feature in their homes. 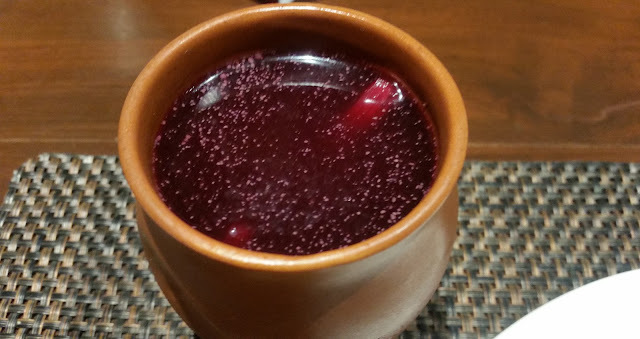 The kanji at Punjab Grill had a buzz due to some extra mustard, and multiple refills of the lovely drink kept me company throughout my dinner. The festival has a concise menu of about fifteen items, all available a-la-carte. Neatly divided into aperitifs (three), starters (four), main courses (six) and desserts (two), there are enough dishes for both vegetarians and non-vegetarians. The first starter was the vegetarian Tikki Choley. 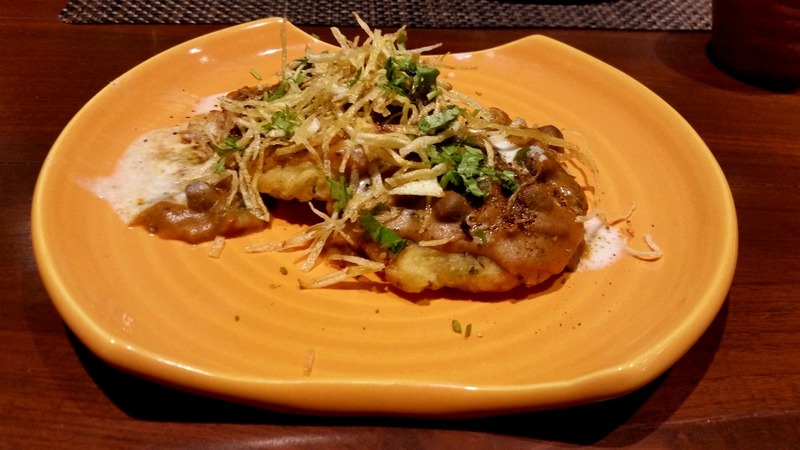 A well-known chaat items from North India, the dish was presented very nicely. It had a simple taste, but did not appeal much to me as I like my choley to be more tangy and spicy as is available on the streets of Delhi. The next dish Mutton Tawa Tikke was a winner. 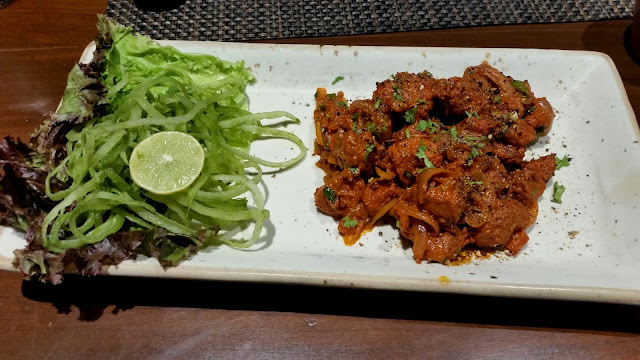 A boneless mutton recipe from Amritsar, this spicy dish had pre-cooked mutton sautéed in a tawa with select masalas. 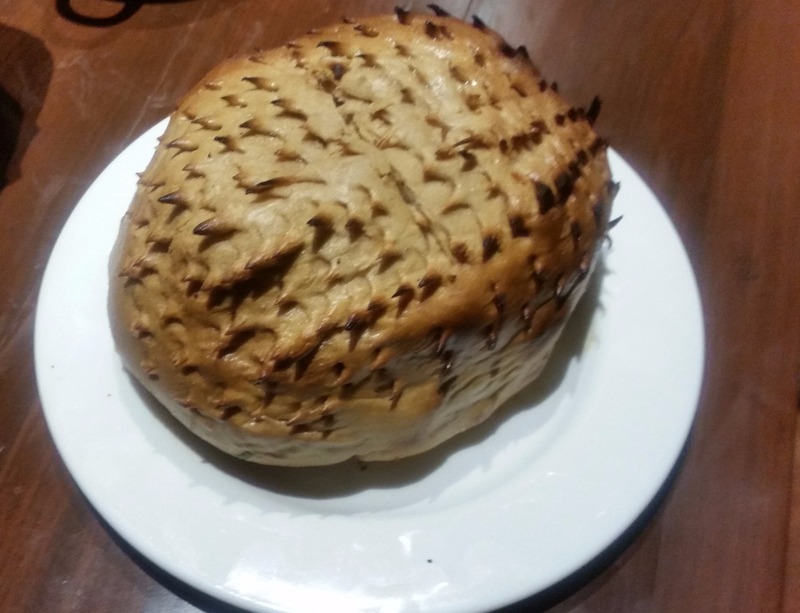 The end result was an extremely attractive looking dish, where the taste justified its looks. The spices were finely balanced and the mutton had become very soft from double cooking. 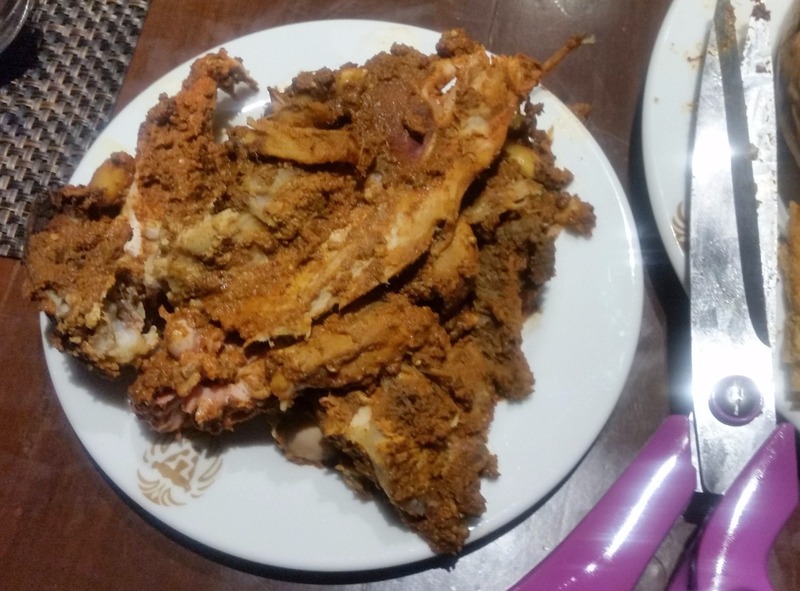 Chargha Murgh was the Punjabi version of fried chicken. Chargha in Pashtoon means chicken, and this is a recipe from Lahore, chicken pre-marinated and steamed with select spices is finally deep fried. I loved this dish for its crunchiness and would recommend it for people who like spicy starters. One of my fellow diners was jocularly referring it as the Punjabi counterpart of KFC, though the recipe here uses abundant oil adding to the taste. Among the main courses was the well-known Atta Chicken. For this recipe, a small whole chicken is marinated in spices, wrapped in a muslin cloth and then completely encased in atta dough. This is now thrown into a tandoor and the chicken is allowed to cook inside. The unveiling of the chicken by cutting open the dough is a gig to watch, though frankly on trying out the chicken I was not really impressed with the masala. 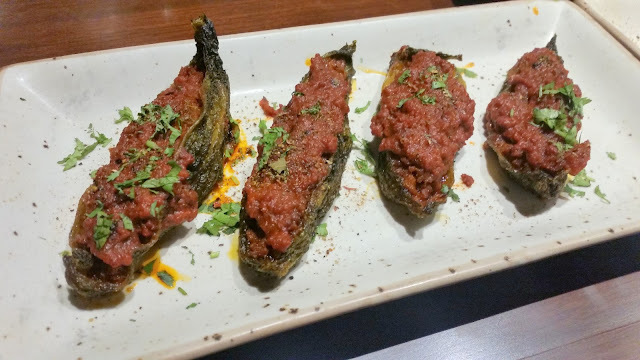 Keema Karela or bitter gourd stuffed with mutton mince really tasted good for me. I am no fan of karela, but here the bitter taste was mostly overwhelmed by the chatpata keema. Just in case you want the dish to be more keema-laden, the restaurant serves some extra keema in a separate bowl for you to customize. Again a dish to be ordered here. A version of butter chicken, Makhani Chooze 1965 went well with the bread basket of naans and kulchas. The tomato based gravy had large and chunky chicken pieces and had a thick texture. Order this if you love tangy food. 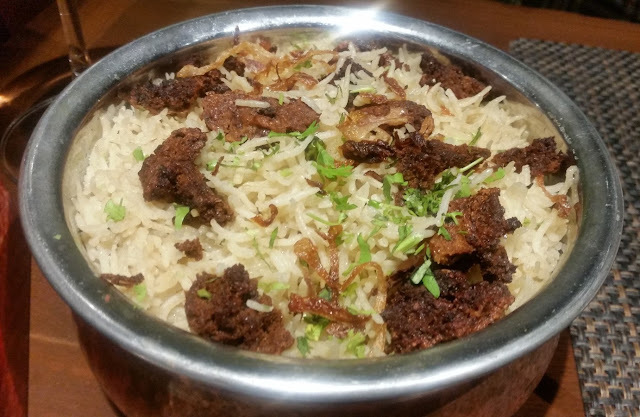 As a rice dish, Wadi Pulao was served. Fried lentil dumplings are used in this rice based dish. While the rice tasted nice, the wadis were slightly bitter due to over-frying. 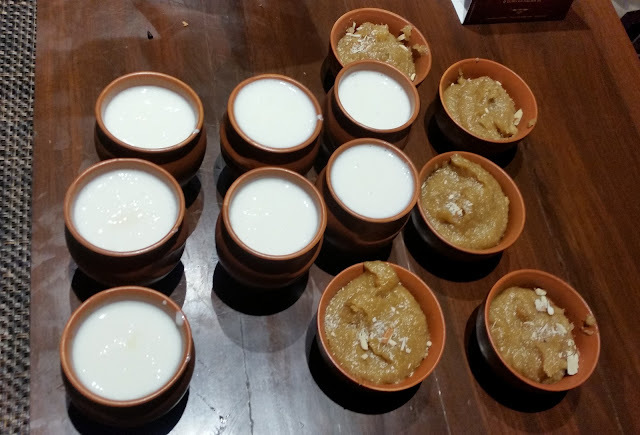 The dessert section had two choices – Gur Ka Halwa and Fruit Cream, and we were served the former. We asked to try out some Makhan Wali Lassi from the menu, and this well-balanced concoction worked well with me. 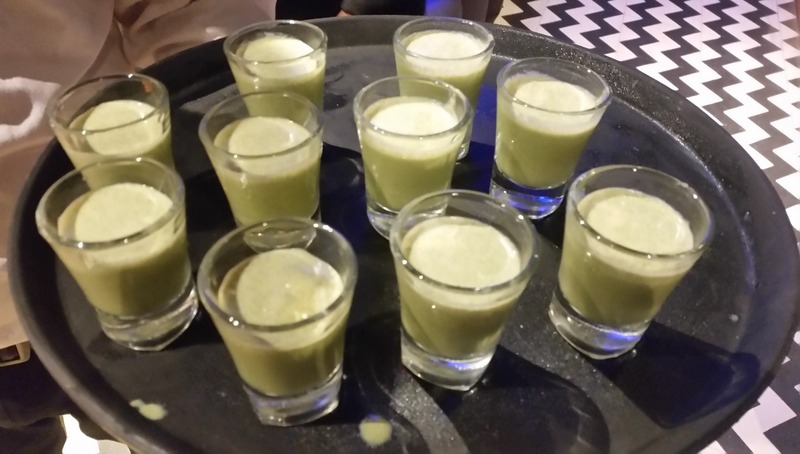 We ended our dinner with Paan Shots which Punjab Grill is known for. We had sampled most of the special festival menu, though some of the other dishes which looked interesting included Kharode Ke Shorba (Bone soup) and Mutton Champa. Rangla Punjab is on until March 26th as an a-la-carte festival. Do try it for some new and uncommon dishes.